When having a look at the words ‘Love’, ‘Care’ and ‘Affection’ what I am able to bring here to this real time moment is, in some part memories from my childhood in relation to my parents and also current insights I have had. Since I was a child I remember hearing from my mom that the kind of love my dad was able to express was more related to care, meaning, to be with you, to support you, like DOING things for you more than saying ‘beautiful words’/ 'nice things'. You know, there are many different ways in which one can express love. So, I am able to say that it took me a while to see, realize and understand what love is when it comes to doing/expressing it physically beyond words that fade away and that are not unconditionally lived in every moment. I grew up not very used to hear nice words towards myself, because what I got from my parents has always been in relation to Care. I mean, it’s not that I was NEVER told nice words, but ...anyways. The point where I want to go here is within the friendship dynamics, especially friendship among males, because it is there where I have seen myself performing these patterns that I have learned throughout my life due to my aforementioned relationship with love. It was 2012 I think when a new colleague approached me and said ‘I am new here, but I know that I am going to have 2 good friends’. He mentioned me and another colleague. As this guy likes astrology and those things I thought he was expressing that statement based on the horoscope, numerology, and those things but, I don’t really know. One day we were hanging out with some other collegues and suddenly someone said ‘I have noticed some rivalry between Pablo and X. It’s like there’s something going on within themselves’. I looked at X’s face and he seemed uncomfortable. Some days later X and I started having a chat on facebook and he started telling me about some issues within his marriage. This happened before I found Desteni, so I remember that I judged him from a moral stance/perspective. I even told him my point of view and now I am able to see that it wasn’t cool at all if I placed myself in his shoes back then. Later, in 2013 we started kind of interacting more. We used to teach the same classes, so there was lots of communication going on. I learned a lot from him. This happened by the time I was doing the Desteni I process Lite course, so this time I was able to consider other perspectives beyond the binary way the mind has to process information. So, one day X comes into me and says ‘Pablo, I think you are a very intelligent person. You have changed yourself a lot’. In that moment, I felt very uncomfortable, because of my background with regards to ‘love’ and ‘nice words’. He continued ‘What you have done is awesome. It’s like you used to be a close-minded moralist, but you were able to deconstruct yourself and now you are a new human being’. I didn’t know what to say, if I remember correctly, I said nothing. I tried looking ‘normal’ but my physical expression wasn’t fluent, I felt uncomfortable within my human physical body, like all my facial gestures seemed hard to syncronize in harmony. Last week X needed some help with assembling a furniture, because he is moving in to a new place, so he is currently buying some new basic items. I took some screwdrivers, a hammer and I went to his house. The next day he sent me a message that said ‘Thank you, good Summer (Summer is my nickname) for always supporting me. I love you so much, brother. You are a great friend’. And again, I felt this discomfort within myself that reminds me of this viral video about a dog that during its entire life the only thing he experienced was punishment/abuse and the video showed how the dog reacted to love for the first time, like fearfully embracing it. Well, what I did was to answer in a sort of joke something like ‘what a sweet dumbass’. But my first reaction was physical discomfort and as this happened in a chat, it was easier to give a step back, release the pattern and embrace it without getting speechless. So, what I have noticed is that I have duplicated my dad’s love signature so to speak. And it’s only with girlfriends that I have explored affection through words and the touching and things like that, but this has never happened with male friends, probably because of the patriarchy device of control ingrained within myself through the culture I have been immersed in within my whole life that functions as the principle ‘males that express affection between themselves are gays’. Plus, I have grown up having my dad believing I am gay, because when I was a teenager I used to paint my finger nails and dye my hair, but it was actually more related to punk rock than being gay lol. I remember that the day I helped X, I had forgotten the tools to assemble the furniture, so we came to my house and there was my dad washing his car. I told X ‘Do you dare to meet my dad?’ and he said nothing, so I said ‘I dare you’ and he said ‘I dare you to introduce me as your boyfriend’ lol. That would have been a cool experiment, but it didn’t happen. Okay, so what I am able to see here now through opening up this point through writing is that there exists this fear within myself. Fear of expressing myself with affection and also to say what I like from other people. Simple things just like ‘Thank you for being here and letting me learn from you’ and/or ‘Thank you for seeing me, thank you for listening to me, thank you for being patient with me and thank you for being a great companion’. That’s all. What happens next is up to us, to live love as an unconditional expression of mutual support without creating expectations, just embracing the moment and challenging ourselves to deconstruct our patterns that inhibit us from expanding ourselves. I forgive myself that I have accepted and allowed myself to become speechless when someone tells me ‘nice things’ about me that I react with discomfort within my human physical body and my facial gestures get influenced by energy and thus, I get out of sync/balance with my beingness expression here. I forgive myself that I have accepted and allowed myself to fear being seen as ‘gay’ if I express myself with affection towards other males, without understanding that the rejection is cultural and also due to the belief my dad created towards myself during my teenager years where he thought I was gay for painting my fingernails, dying my hair and having only male friends. I forgive myself that I have accepted and allowed myself to have suppressed what I have wanted to say towards my friends because of the thought ‘I don’t have to show affection through words’ in a sort of ‘boys don’t cry’ axiom. I forgive myself that I have accepted and allowed myself to not realize how culture molds us through infecting our minds as thoughts, feelings and emotions and thus, our natural expression as human beings becomes programmed and then we obidiently follow what our minds dictate without deconstructing the patterns through self-honest self-instrospection but only perpetuating the programming. I forgive myself that I have accepted and allowed myself to fear expressing affection/love beyond what the culture/church/religions/families/moralists impose that we accept by default just by being born in a world full of boundaries that only exist inside our collective mind that end up functioning as self-limitations that inhibit us from embracing each moment here. I forgive myself that I have accepted and allowed myself to have blamed my dad for the way I am, without realizing that instead of judging I could start applying with him what I am learning here through these insights. I forgive myself that I have accepted and allowed myself to have rejected my dad’s kiss when he took me to my first day of third grade in highschool after we had moved to this city 16 years ago, because I feared being seeing as a fagget by my new classmates. I forgive myself that I have accepted and allowed myself to have experienced discomfort towards my dad when he nowadays approaches me with tickles and/or squeezes, because I think that that’s invasive and that I am already ‘grown up’ to do that, without realizing that we both used to enjoy that since I was a child and it doesn’t have to stop happening because my mind system dictates so due to having programmed thoughts, feelings and emotions. I forgive myself that I have accepted and allowed myself to have judged my dad for the way he is in terms of his expression; voice, facial gestures, the way he moves and behaves, without realizing that that is a cool point of reference for me to see myself in him, to realize and understand that we are one and equal and that all I see in him can be directed within myself through self-honesty and self-forgiveness without judging and/or blaming but perfecting it through practical application after the realizations I have had through this self-writing exercise. I forgive myself that I have accepted and allowed myself to experience fear within myself when I have told my dad that I have visited a male friend, because I think that he could think that I am gay, without realizing that what each person thinks within their secret mind is something I can’t help and it’s their responsibility to address it within their own processes. I forgive myself that I have accepted and allowed myself to have given too much importance to what other people may think of me, without realizing that in doing so I am suppressing my expression and not fully being here through embracing each and every moment. When and as I see myself having someone telling me ‘nice things’ or positive feedbacks about me and I react with discomfort within my human physical body, I stop and breathe. I realize that this discomfort is caused by how I have experienced ‘love’ and ‘affection’ since I was a kid, because I am not used to be told those things. rs installed within my mind system and body through biopower apparatus/deployments. I commit myself to just express what I want to express in the moment when having someone telling me ‘nice things’ about me and if I don’t know what to say, just share that I am not used to that and to open up by saying that I am currently working on it, but that I am glad to be told that. When and as I see myself blaming/judging my dad for the way I am today, I stop and breathe. I see, realize and understand that my dad is me, one and equal, and that if I have identified the patterns I have duplicated from him, it’s then my responsibility to direct those points as a living example. I commit myself to stop judging/blaming my dad for the way I am in terms of how to express love/affection. I commit myself to embrace my dad’s expression in relation to how he expresses love/affection. When and as I see myself fearing that people may think that I am gay if I express nice words and affection towards male friends, I stop and breathe. I see, realize and understand that first of all it’s unacceptable to be worried about what other people may think of me and that I can also deconstruct myself when it comes to being affectionate/gentle with my friends. 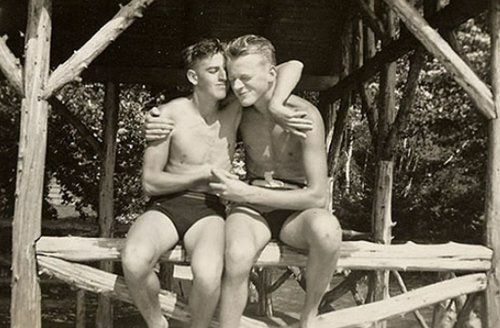 I commit myself to stop fearing that people may think that I am gay if I want to share/express some affection or gentleness with a male friend through words or touching/hugs. I commit myself to stop suppressing my expression with male friends. I commit myself to just embrace the moment and be open to share my love/affection with male friends through not fearing to provide feedback through verbalized/written love/affection through words and also physically.